Melbourne’s first serial killer is at work and only one man can stop him. Berlin’s investigation leads him through inner-city discothèques, hip photographic studios, the emerging drug culture and into the seedy back streets of St Kilda. The investigation also brings up ghosts of Berlin’s past, disturbing memories of the casual murder of a young woman he witnessed in dying days of WW11. ST KILDA BLUES is the third novel in the Charlie Berlin series. Both previous novels, THE DIGGERS REST HOTEL and BLACKWATTLE CREEK, won the Ned Kelly Award for Best Fiction in 2011 and 2013 respectively. There is such an assured hand behind these crime fiction novels from Australian author Geoffrey McGeachin. There are plenty of historical details to place this novel in 1967, and to anchor it firmly in Melbourne. It is twenty years since the first novel in the series and Charlie’s son Peter has gone into the army, and his daughter Sarah has gone to Israel to learn more of her Jewish past. Charlie’s wife Rebecca has become a well known photographer with her own studio in the CBD. There’s plenty in the novel to fill in the details of what has happened in the Berlin family in that twenty years. also those who would love to see him fall flat on his face. It appears that nine teenage girls have gone have gone missing in Melbourne in the last year. When number 3 was reported Charlie was taken off the case and sidetracked to the Fraud squad. Now somebody has decided that he should take over the investigation again, but on the quiet. The State Premier is Sir Henry Bolte, his own position on a knife edge, and he wants all stops pulled out. Only one of the girls who have gone missing has turned and she was found dead on the shores of the Albert Lake. An observant copper gives Charlie and his offsider Bob Roberts their first clue. There is a side story that surfaces in the first half of the novel about a boy who was sent to Australia from the UK shortly after the Second World War, as part of a child emigration scheme. He arrives in Adelaide and is then taken north to a mission station. This is an interesting plot line because the treatment of such children has been the focus of recent investigations, worldwide, into the way children were treated in orphanages. In Australia the investigation has provoked a Royal Commission into Child Abuse. So there is plenty in this novel for the reader to think about. The historical validity owes a lot to meticulous research, while the principal characters come through loud and clear. There’s also a distinctively Australian flavour to the novel. It’s September 1957 in Melbourne and Detective Sergeant Charlie Berlin has been, somewhat grudgingly, given a week’s leave from his job investigating the worst of the city’s missing persons cases. Looking forward to building a dark room for his wife, Rebecca, in their back yard Charlie thinks nothing of first talking to a friend of Rebecca’s who noticed some peculiar behaviour by the undertaker when organising her husband’s recent funeral. A combination of conscientiousness and curiosity prompts Charlie to visit the funeral home where he learns some things that trouble him. When his seemingly innocent questions result in one of his few friends being beaten up, Charlie feels unable to let the matter drop. It’s quite brave of an author to set their second book in a series more than 10 years in time from the first. Keep up that gap period and the series will be a short one indeed by today’s standards. But it’s an excellent way to allow the central characters to display genuine personal growth between books and McGeachin made full use of the gap for that purpose. The series’ protagonist is still a policeman, still something of a loner professionally and still haunted (literally) by his wartime experiences as a RAF pilot then POW. But now he has a much-loved family, his nightmares are less frequent and he has a greater control on his behavioural excesses. With reasons to live he is an even more engaging and interesting man than when we first met him in THE DIGGERS REST HOTEL when he was not long back from the war. His attitude and approach to life has a very authentic feel to me and not only because in it I recognise traits of my father’s, like the way he can’t always put into words how much he loves his family but shows it in wonderfully practical ways like carefully shining all their shoes with polish and brushes each week (the scene in which this is depicted brought back vivid memories of my own family’s shoes being lined up for weekly polishing every Sunday night). His wife is a strong character too, willing and ready to support and nourish Charlie when needed but there’s no hint of downtrodden housewife in Rebecca as she forges her own career and takes charge of the couple’s love life. Minor characters are nicely drawn too including a Hungarian journalist-turned-hearse driver (who is one of the good guys) and a poncey British doctor (who isn’t). 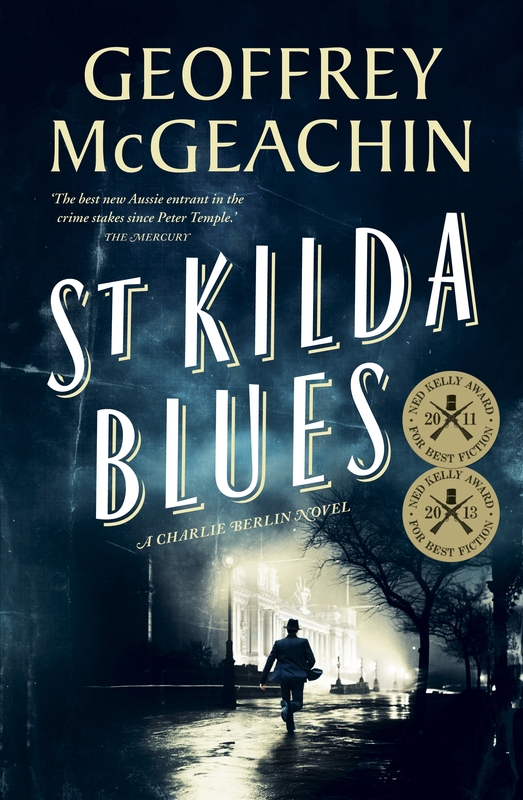 McGeachin has excelled at drawing out the small details of life that depict a time and place to perfection and I had no trouble picturing the edge-of suburbia setting of Charlie’s home, the sinister institution where nefarious activities were taking place or the inner city streets of Melbourne alive with a post-war (and post-1956 Olympics) mish-mash of cultures as immigration made its presence felt. Even the political environment of the time gets the same deft treatment as McGeachin shows us that it’s not only in the current day that governments are prepared to keep the masses in the dark ostensibly for our own good. In an odd way I found it kind of comforting to think that we probably have been through the same kinds of things as we’re experiencing now and managed to pull through with at least a shred of collective humanity and backbone intact. Perhaps there is hope after all. Finally, though in some ways most importantly, Blackwattle Creek is a ripper of a yarn. I had no idea where the story was going to take me and needing to know kept me up late into the night. For a crime fiction author to be able to generate in me the same sense of shock as was being experienced by the book’s protagonist as he uncovered the frightening (and frighteningly credible) facts of the case is a fairly rare thing these days and I revelled in it. 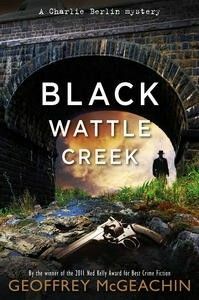 Although I thoroughly enjoyed this book’s predecessor I think BLACKWATTLE CREEK is an even better book and one I can’t recommend highly enough. It’s two years since the end of the second World War and Charlie Berlin has returned to Australia, having been a bomber pilot in Europe then a POW in Poland. It’s fair to say Charlie’s was a grim wartime experience and he is still haunted by things he saw and did. Upon returning to work as a Detective Constable in Melbourne he learns that all the colleagues he started out with have moved up the hierarchy (the police force was exempt from the military draft and officers were discouraged from volunteering but Charlie had family reasons for joining up) and he gets all the worst assignments. Which is why he’s the one sent to rural Victoria, on the border with New South Wales, to investigate a spate of armed robberies, the latest of which resulted in a paymaster being badly injured. He arrives in town to be greeted by a young constable, Rob Roberts, who will drive him around (and report back to the local Sergeant who is not entirely happy to have someone from the city on his turf) and the two form a complementary team of investigators with Charlie supplying the experience and Roberts providing the local knowledge. The historical aspects of the novel are extremely well done; feeling authentic through the use of interesting details but not overblown with evidence of the author’s research. Everything from the rationing that the country was still experiencing to the kinds of foods that might have been served in a country pub at that time to the photographic equipment and techniques utilised by the adventurous female photo-journalist that Charlie encounters during his investigation are both accurate and woven into the story seamlessly. Some of the less pleasant aspects of life during the time are also well depicted including the fairly shabby treatment of anyone who wasn’t white. It really did feel like I was transported back to the time, a factor helped I think by the excellent narration of the audio book in which the language and slang were pronounced to fit in with the period. In that crime fiction has something of a plethora of men who have returned from war forever changed Charlie Berlin is not a particularly unique character. However his particular trials and tribulations are engagingly teased out and his character does have a solidly credible feel to it. Through his conversations with Rebecca Green, the photo-journalist, and the memories that sometimes stop him dead in his tracks (and send him reaching for the whisky bottle) we learn enough about his war time experiences to sympathise and feel sorrow for Charlie and the thousands of others like him. We see too through the investigation how the war has impacted on other returned soldiers and the families of those who didn’t make it back. In the end it is Charlie’s understanding of these impacts on various people that enables him to work out not only who has been committing the robberies but also who isn’t (and then who is) responsible for the rather grim murder that takes place while he is in the town. The crime solving here at times appears to almost be an after thought but that would be too simplistic a way of looking at things. Charlie believes that you need to know a place and its people in order to solve a crime and his meandering from crime scene to crime scene and meetings with various people in the town all do have a purpose. The upside for readers is that we too get a sense that we’re really getting under the skin of the town at the same time as we meet all manner of poignant and intriguing characters. Like the wife of the Diggers Rest Hotel publican who is beaten sometimes because her husband is enraged at having been injured before he could go to war, or the retired WWI Captain who is so convinced that communists will be invading some time soon that he is raising his own militia. A tiny part of me is, I admit, a trifle weary from reading about the horrible experiences of people returning from wars. No matter how many times the consequences are depicted in harrowing ways we seem, collectively, to jump at almost any chance to fight and kill and hate all over again so I do sometimes wonder if there is any point. But if it is going to be done then it should be done well, and McGeachin has done a first rate job here, capturing both the universal truths that are associated with the experiences and the peculiarly Australian, somewhat laconic way of dealing with the nightmares and other repercussions (a combination of beer, football and the occasional bit of pointless biffo). With down-to-earth, very believable characters and a strong, enveloping sense of place and time THE DIGGERS REST HOTEL is a top notch work of historical crime fiction. 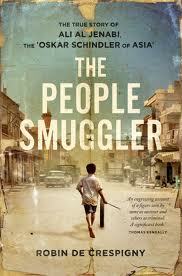 This book is one of three which has been shortlisted in the best fiction category for this year’s Ned Kelly Awards. The other two are Angela Savage’s THE HALF CHILD and Chris Womersley’s BEREFT. When Berlin travels to Albury-Wodonga to track down the gang behind the robberies, he suspects he’s a problem cop being set up to fail. 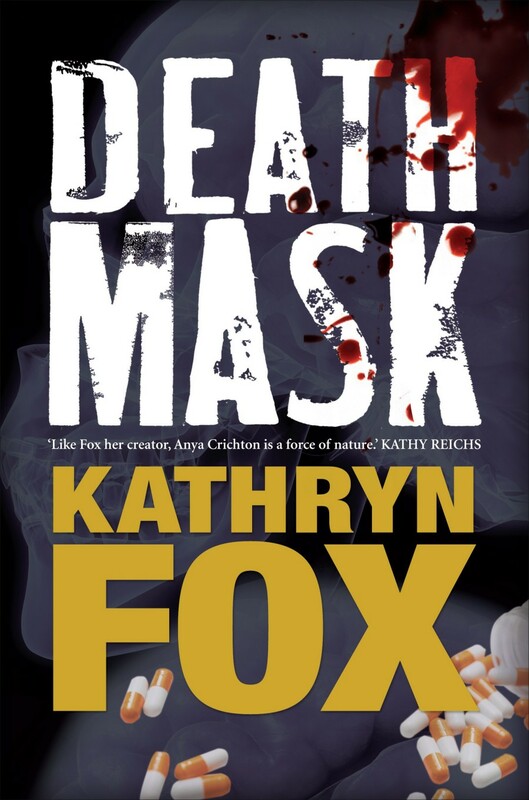 Taking a room at the Diggers Rest Hotel in Wodonga, he sets about solving a case that no one else can – with the help of feisty, ambitious journalist Rebecca Green and rookie constable Rob Roberts, the only cop in town he can trust. Then the decapitated body of a young girl turns up in a back alley, and Berlin’s investigations lead him ever further through layers of small-town fears, secrets and despair. The first Charlie Berlin mystery takes us into a world of secret alliances and loyalties – and a society dealing with the effects of a war that changed men forever. For me, Geoff McGeachin has hit on a winner with this new series and I hope we see more of Charlie Berlin. 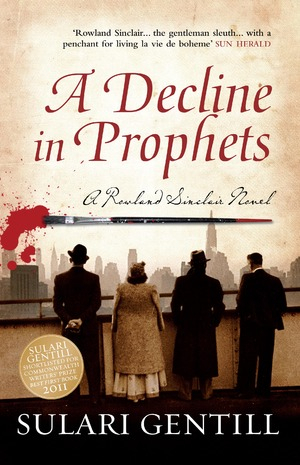 It appealed to me on several fronts – historical, crime fiction, Australia. 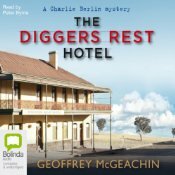 Set in post-war Australia, this time post World War Two, with a policeman returning to work in a world that will never be the same, THE DIGGERS REST HOTEL reminded me a lot of the Charles Todd series. Like Ian Rutledge in that series Charlie Berlin was in the police force before the war. Although the police force was an exempt trade he volunteered for service and was posted to the RAF in Britain. He took off on 30 missions over Germany, but, in his words, landed only 29 of them and ended up a P.O.W. Now two years after the war he has returned to work, and found that those who didn’t go are now in charge, in positions he should be occupying. He feels like a square peg in a round hole, and, like Rutledge, is sent from the city to the country to solve a crime. He is still suffering from post-war stress and has blackouts and nightmares. Like Rutledge too Charlie is met with local suspicion and hostility and demands for quick results from his superiors back in Melbourne. McGeachin has taken care with the historical detail and it gives the novel a great feeling of authenticity. (You get the feeling that McGeachin is describing a world he knows well.) Berlin has come back to a world fractured by the war. Australian society is trying to absorb the returnees, women who took on men’s jobs during the war are expected to relinquish them, and for some of the returned servicemen there is no work. There is no excitement either. Areas like Albury-Wodonga where THE DIGGERS REST HOTEL is set are littered with munitions and equipment from abandoned army camps and weapons stashes. Some of the ex-servicemen do not believe the government is doing what it should and private militias appear to provide an answer to many problems. You can probably tell that I very much enjoyed Charlie Berlin’s initial case and hope we see more. 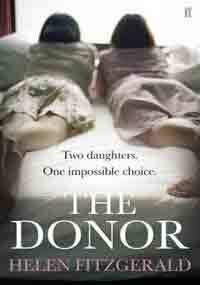 This is a very different novel to McGeachin’s D-E-D DEAD! which I also reviewed. From the moment Alby drops his gun on a St. Kilda tram he knows he is in for a bad day. Then his partner Harry is gunned down in a Double Bay coffee shop. By lunchtime Alby realises someone wants him dead – and they want him dead now. Alby Murdoch is a famous photographer working for WorldPix International, a front for an Australian ultra-secret government department D-E-D, the Department for Extra-territorial Defence. He and his partner Harry are supposed to be doing the biannual positive vetting on US personnel at Bitter Springs, a US-Australian Joint Defence Facility out in the middle of nowhere. Harry it seems found something wrong with the CIA’s list of 300 names and dates of birth of people working at the Springs. On the surface D-E-D DEAD! has all the hallmarks of a conventional spy thriller – assassins, bombs, car chases, and the obligatory beautiful female CIA agent. But the irreverent and comedic treatment that emerges at times shows that it is a spoof. Alby and his new friend Mary Travers flee to Bali and hitch a boat ride to Broome. 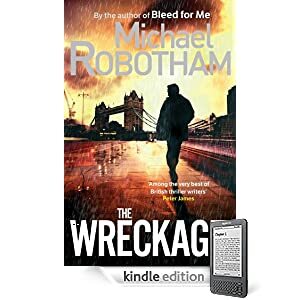 An unconventional and enjoyable read if you don’t mind a bit of Australian laconic humour and slang mixed into your thriller. Not entirely my cup of tea, but I still rated it at 4.4. McGeachin’s first novel, FAT, FIFTY & F***ED! 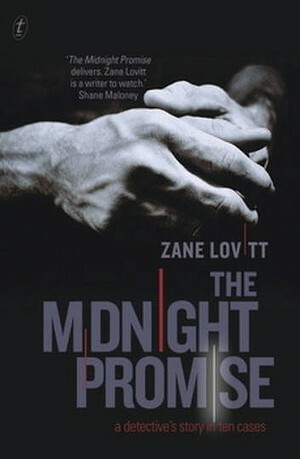 won the inaugural Australian Popular Fiction Competition and was published by Penguin in August 2004. D-E-D DEAD! 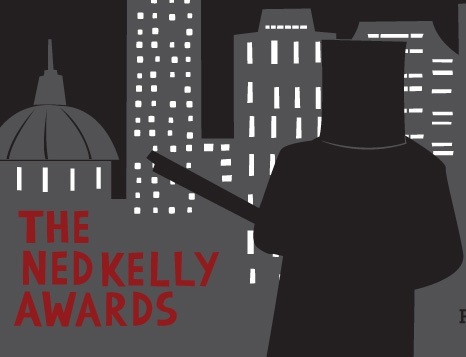 introduced Alby Murdoch and was nominated for a Ned Kelly Award. It was followed by SENSITIVE NEW AGE SPY in 2007, also nominated for a Ned Kelly Award. In 2009 #3 DEAD AND KICKING was published.